The Good Trade's Week of Outfits Series highlights women that have personally inspired us to shop and live with intention! Each woman takes her own unique approach slow fashion and demonstrates how beautifully sustainable fashion can come to life. 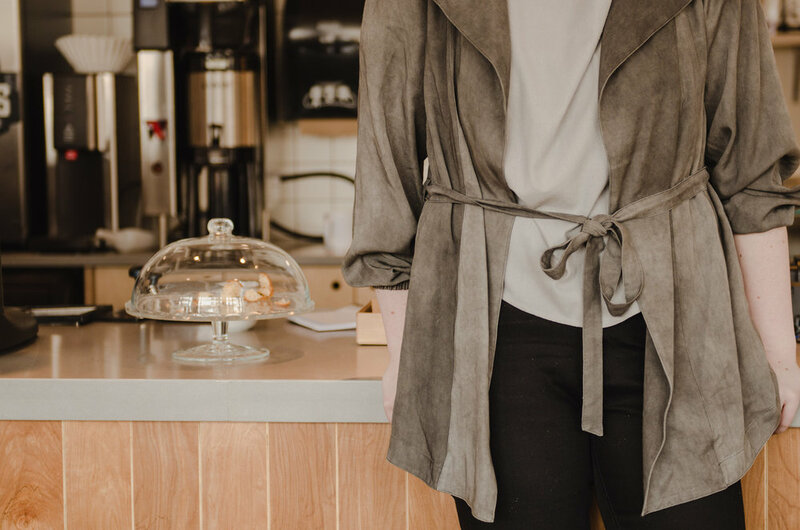 Today we're excited to share a week of outfits from Emilie Maine, the founder of Maine Ethics! I started Maine Ethics because of a desire to help teach people more about fair trade, sustainability and ethics. I remember when I first started learning about these topics, and I was so overwhelmed that I had no idea where to start. Over many years, I educated myself about these topics, and now by breaking down these issues, I help make ethical easier for people. A big part of making ethical easier is talking about fashion and sharing important information pertaining to fashion trends, manufacturing, politics, and social justice. I don’t think I’m a particularly fashionable person, but I see the important role that fashion has played throughout history socially and politically, so I surprisingly care about fashion a lot. Fashion and style is something that everyone can somewhat relate to, and is used as a marker of identity, culture, individuality, or collectivity. I not only support and educate people about slow and ethical fashion because I care about garment worker rights or the environment, but because I see fashion as a great tool to get people talking about relevant social justice issues. A big frustration of mine is that ethical and sustainable fashion is still quite exclusionary. From socio-economics and class, to racism or fatphobia, ethical fashion still isn’t accessible to all. Ethical fashion is still typically marketed for, and consistently features, cisgender and able bodied white women, which doesn’t do anything to challenge societal oppression and inequities. I want ethical and sustainable fashion to be accessible, and a part of larger social justice conversations. Personally, my approach to fashion is exploring alternative ways of shopping and dressing that won’t break the bank, and discussing the issues surrounding accessibility and inclusivity in ethical fashion. Thrifting, consignment and vintage are some of my favourite ways of promoting sustainable consumerism. Not only is it budget-friendly, but it also extends the lifespan of items, rather than buying something new. Most of the clothes featured for this week of outfits have been thrifted, costing me less than $5 for most items. My advice to people is to throw out all ‘rules’ about style, and dress in things that make you feel the most confident and empowered. Clothing doesn’t have a gender. Clothing can be worn by everyone, despite society telling you to ‘dress for your shape’. Wear stripes or tight clothing, or mismatched prints if that what makes you feel the best. Fashion shouldn’t oppress you and how you choose to identify. Fashion is a political act, and you get to define what that looks like for you. This is my go-to errand running outfit, because it feels comfortable, but still makes me feel as though I've dressed up a bit. The jeans and shirt are fitted, but my oversized jean jacket with huge pockets keeps the outfit looking casual. 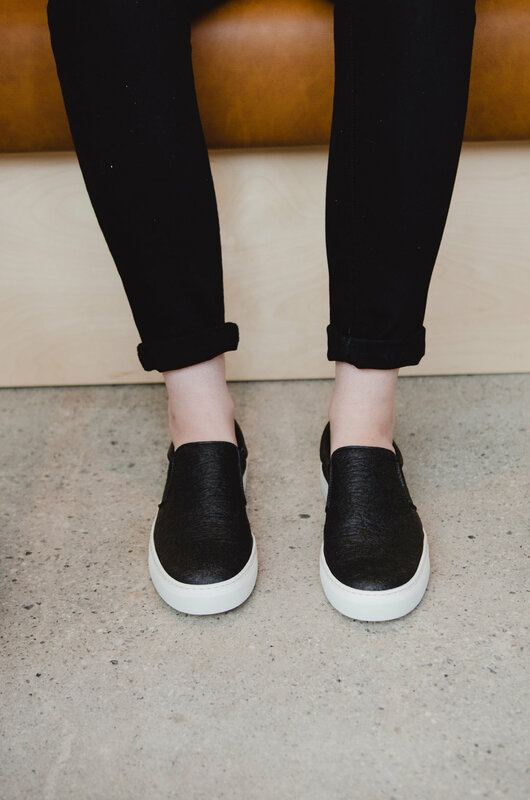 These pineapple leather shoes are perfect to slip on, and match everything in my wardrobe. I typically wear only neutrals, and this two-tone grey combo gives more depth and texture to an otherwise plain outfit. I also love that a majority of this outfit was made by businesses that are owned and run by women. The foundation for this outfit was this pair of vintage ‘men’s’ oxford shoes that I found for only $3! I paired them with a cropped jean to really highlight the shoes. It’s a dressy casual look that I can sit and do work in, but then later can attend a meeting in. This is probably the outfit I wear the most in a week. Matching black on black means I just have to pull these two items out of my closet, and I know they’ll work together. Then, I just change out my shoes to either dress it up, or dress it down, depending on what my day looks like. Where I live, layering is essential. The morning could be freezing, but by the afternoon, the sun could be out and shining. My jean jacket is functional so I can stash my wallet and keys in the pockets so I don’t need a bag, and the knitted turtleneck keeps me warm. I re-wear a lot of pieces throughout the week because I have a small wardrobe. This grey shirt is great for layering, but I also like wearing it by itself, as the raw silk is just so gorgeous. It’s definitely a staple piece for weekend brunch, or even when i’m working on projects in a coffee shop. I’m actually the most productive on Sundays. I like to plan out my week, work on any projects I need to complete, and meet with friends or colleagues. I like to also use Sunday to walk to my destinations rather than drive, so I paired my much loved jacket with a cozy sweater and jeans to keep me warm. This bag was gifted to me by a friend over 9 years ago, and it’s still one of my favourite things I own.